Initial exploratory stage in data analysis and mining require quite a bit of data visualization, data preparation and trying out multiple algorithms. Being a beginner in R, I find it cumbersome to do all the exploration writing code in R. While searching for a nice GUI for R and stumbled upon this piece of software called Knime. 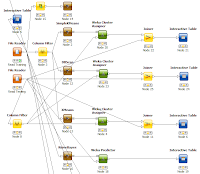 Knime is based on the Eclipse platform. It provides a nice GUI for creating a workflow for data analysis. It allows you to chain together modules into chains and branches progressively to create complex analytics. Knime comes with some in-build modules, integrates the Weka Machine Learning modules, and integrates with R as well. Use scatter plots, summary views and data views to visualize the data. Knime comes with a limited set of functionality, it integrates them really well. Knime comes with R built in. It can also connect to a remote R server. Integration with R is not as exhaustive as Weka. It essentially needs you to write R scripts that it then executes on the R server. It provides predefined variable names that you can pass or retrieve from R.
I would use Knime for preliminary data analysis and visualization. Once beyond the exploratory stage I'd still go back to R scripts and do it purely on R. May be after that the R script can be plugged in to Knime for using it with larger workflows. There is an exhaustive list of different tools in the market, both commercial and open source, here.